Tabasco company chief executive officer and former Marine reservist Paul C.P. McIlhenny died Saturday in New Orleans of a heart attack at 68. See the company’s death announcement here. His family, and its proud Marine tradition, has served the Corps in battle and later during chow time for generations. In 1993, miniature Tabasco bottles were added to the military’s Meals Ready to Eat, where they remained a staple for years until DOD — in a cost-savings move — replaced them with small Tabasco pouches. Nevertheless, the famous hot sauce continues to be a welcome bit of spice, saving deployed Marines from the otherwise bland (and occasionally rank) shelf-stable meals in a pouch. McIlhenny, who served as an artilleryman, joined the family-owned company in 1967 and became president in 1998. 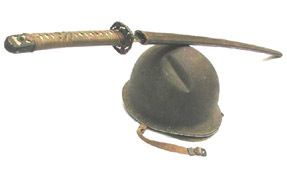 Walter S. McIlhenny’s helmet was damaged during fighting in the Pacific by a samurai sword that he later captured. Both are on display in New Orleans at the National WWII Museum. His cousin, Walter S. McIlhenny, who served as the company’s president until his death in 1985, was also a Marine. Walter retired as a brigadier general after a long career that included service in the Pacific during World War II. He fought at Guadalcanal, New Britain, and Peliliu. For his actions he received the Navy Cross, Silver Star and Legion of Merit. In one fight he was struck in the head by a samurai sword. Fortunately his helmet absorbed the impact and he later captured the very sword with which he was struck. Both are on display at the National World War II Museum in New Orleans. But, in the minds of most Marines, soldiers, sailors and airmen, the McIlhenny men will be best remembered for the family’s spicy addition to the MRE, which is more than just delicious. According to a 2008 Air Force News Release, it can be medicinal. Here are a few off-label uses for that little bottle of liquid wonder that could make your life easier in the field. A chemical in Tabasco’s main ingredient — cayenne — helps reduce discomfort by blocking a chemical that transmits pain through nerves. Cayenne is rich in a natural aspirin-like compound. The Air Force release suggests massaging a balm containing Tabasco into your temples for relief from headaches if you don’t have Aspirin. Tabasco is a good gargle for sore throats. Just add 10 to 20 drops into a glass of warm water. Tabasco can be used as a liniment for sore muscles. Capsaicin, found in cayenne, can reduce chronic nerve pain caused by conditions like arthritis, shingles, trigeminal neuralgia, and diabetic neuropathy. It could take several weeks of regular use to feel the effects, though. Be warned, however, that the cayenne pepper in Tabasco is a natural blood thinner so it should not be consumed in large quantities before surgery. Tabasco can be used as an impromptu bug repellent. When coffee isn’t cutting it, some troops desperate to stay awake during long watches dab a bit in the eyes for some hair-raising, tear-inducing pep. But be careful — the sauce can obviously cause irritation.